America’s most notorious “hanging judge” Isaac Parker issued the sentences resulting in this date’s double hanging at Fort Smith, Ark. A much more prodigious body count had been ordered initially by the court, but clemencies straight from the hand of U.S. President (and former hangman) Grover Cleveland averted five of seven death sentences on their eve of execution. All the killers under sentence, spared or no, committed their murders in Indian Country. Jackson slashed his own throat with the shard of a vase in an unsuccessful bid to cheat the hangman, and sported a terrible gash on his neck when he hanged. On this date in 1875, the most famous — or infamous, depending on your perspective — “hanging judge” of the American West dropped the trap on his noosing career with his first six hangings at Fort Smith, Arkansas. 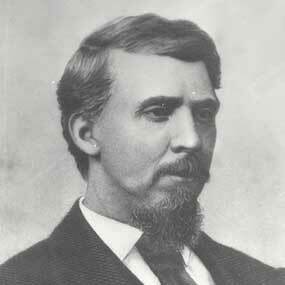 Isaac Parker had parlayed a legal career in Missouri into a congressional seat, when the fall of the Arkansas Republican party’s fortunes late in Reconstruction swept him out of office in 1874. No problem: his co-partisan president, Ulysses S. Grant, appointed Parker to a federal judgeship in neighboring Arkansas. It’s upon that renowned tenure that the man’s reputation, uh, hangs. Parker arrived at Fort Smith on May 4, 1875, the youngest federal judge in the west and a man whose jurisdiction included the lawless Indian Territory (present-day Oklahoma). This expanse of land, the final destination of the Trail of Tears, had once been preserved for tribes forcibly “removed” from eastern North America. But by the post-Civil War years, the frontier was sweeping past on iron wheels … and as long as Indian Territory remained (mostly) protected from white settlement, it remained a sparsely-populated refuge for outlaws. 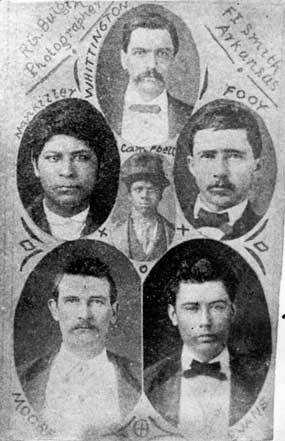 Pandemonium in the Territory was only exacerbated by the Fort Smith court’s reputation for corruption and inefficiency; the office was open for Parker’s appointment because his predecessor had resigned to avoid impeachment. Judge Isaac Parker came to clean up the place. And in those cases he quickly established himself a reputation for severity. But make yourself the law’s instrument to the tune of 79 hangings, and folks are bound to sit up and take notice. At his court’s very first sitting in May 1875, Parker death-sentenced a murderer — Daniel Evans, who came straight from frontier central casting and had murdered a man for his boots. As that year unfolded, he added enough condemned men to the bowels of the miserable jail nicknamed “Hell on the Border” — for an eight-strong hanging date to christen September. One of the eight had his sentence commuted due to youth. One was shot trying to escape. Modern replica at Fort Smith — today a national historic site — of Judge Parker’s gallows. (cc) image from photoguyinmo. The clientele was six unconnected murderers, committing various atrocities for various motives and aptly embodying the region’s ethnic diversity. And the audience? Five thousand or so reportedly on hand in Fort Smith this date, plus a national media audience … and posterity deep into the second century since this sturdy magistrate donned his first black cap and set about putting chaos into order with a rope in his hand. New York Tmes, September 4, 1875. Whatever one might have to say about his methods, Parker presents a magnetic personality, a figure so truly of his own time and place that he obligingly died just weeks after his court was finally relieved of its Oklahoman jurisdiction in 1896. He’d never hang around to jolt our anachronism meter by weighing in on trench warfare or cubism. Parker is undoubtedly a more layered figure than his “hanging judge” reputation would suggest, and even his life’s project to bring his unruly jurisdiction to heel was more complicated than just being a hardass. (He had a significant administrative challenge to manage his chronically underfunded court, and he needed to foster the sense of communal reciprocity and legal integrity that would encourage fellow-citizens to turn up for jury duty and witness testimony that make the law’s everyday business possible.) The judge was famous for the long hours he kept, and capital cases were never more than a tiny fraction of his work. Still, whether you prefer him as the stern avatar of law on an outlaw plain or bloodthirsty yahoo, Parker’s ready amenability to latter-day Hollywood tropes will surely maintain his popularity in the cultural rookery of wild west cutouts. Among numerous other reference points, the novel True Grit, and the 1969 and 2010 films based on it, use Judge Parker’s Fort Smith as the heroine’s embarkation point — with her dangerous journey carrying her into the untamed Indian Territory on his doorstep. Pat Hingle’s “Judge Fenton” (from “Fort Grant”) in the Clint Eastwood western Hang ‘Em High also shows an unmistakable debt to the Judge Parker persona. Spare a thought, too, for the man operating the ropes and levers this date. George Maledon, named Fort Smith’s official hangman just a couple of years before Isaac Parker’s appointment, would enforce the Hanging Judge’s hanging sentences into the 1890s: 60-plus executions in all, plus five other escaping prisoners he gunned down, all in a day’s work for an Arkansas lawman. Maledon has a sad coda to this story, which wasn’t so upbeat to begin with. The year after the veteran hangman hung up his hood and opened a grocery store, Maledon’s daughter was murdered. The bereaved father’s friend Judge Parker, still on the bench at that time, condemned the killer to die in a case we’ll suggest might have warranted a recusal by present-day standards. Nevertheless, a successful appeal balked Maledon’s successor of the malefactor, and the disgusted ex-executioner got his species of payback by taking the accoutrement of his late profession on the road as a traveling act. There, under the billing of “the Prince of Hangmen,” Maledon lectured and exhibited old hanging ropes and pictures of the outlaws they had choked. In February, Arcene and Parchmeal had been convicted of a murder committed 13 years previously. On November 25, 1872, someone had killed a Swedish immigrant named Henry Feigel on the road near Fort Gibson in Indian Territory (now Oklahoma). The case remained unsolved for over a decade. After both men were convicted, Arcene made a confession stating that he had “shot [Feigel] six times, then both took rocks and mashed the man’s head” before dragging him off the road and robbing him of his boots and 25 cents. Judge Parker sentenced both men to hang. – Glenn Shirley, Law West of Fort Smith: A History of Frontier Justice In The Indian Territory, 1834-1896 (1957), 79. 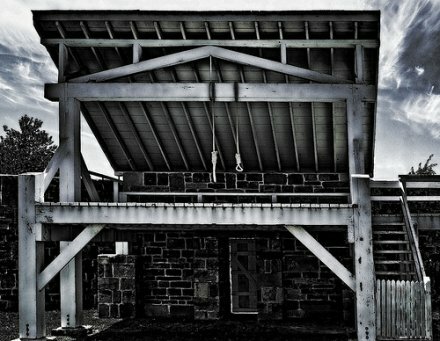 But this execution was peculiar in one significant detail: James Arcene claimed to have been “only a boy [about] 10 or 12 years old” at the time of the murder.† If true, he was one of the youngest criminals in American history to have his crime punished by a federally-sanctioned execution. In March of 2005, the Supreme Court handed down a 5-4 ruling in Roper v. Simmons declaring that states could no longer execute criminals who had committed their crimes while under the age of 18. * See “Murder for Money,” Daily Arkansas Gazette, 27 June 1885 on rain, and “Hanged on the Gallows,” New York Times, 27 June 1885 on Parchmeal’s need for an interpreter. 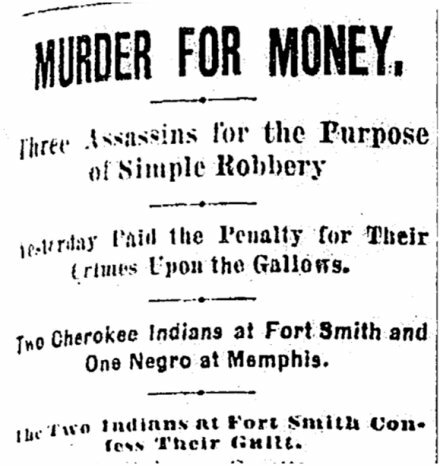 ** “Murder for Money,” Daily Arkansas Gazette, 27 June 1885. 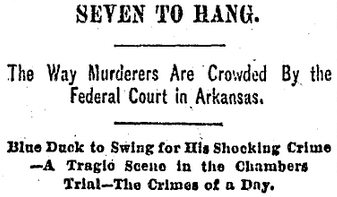 † “Hanged on the Gallows,” New York Times, 27 June 1885. ‡ Judge Parker sentenced 156 men and 4 women to death. Of these, 79 were actually executed, the rest having died in prison, had their sentences commuted, or were pardoned. § It should be noted that many books make the erroneous claim that Arcene was 10 at the time of his execution. This is not the case — all available primary documents agree that he was an adult in 1885. I made this same mistake in my earlier guest post on the case of Hannah Ocuish, having relied on Dean J. Champion’s The American Dictionary of Criminal Justice: Key Terms and Major Court Cases (2005).